Married, wife's name is Francys...The couple has a son, Massimiliano...Cousins with former Major League pitcher Kelvim Escobar...Played in the Major League All-Stars Tour of Japan in November, 2014...Originally signed by the Milwaukee Brewers as a non-drafted free agent on July 9, 2003...Signed by Epy Guerrero. Started a Kansas City Royals record 421 consecutive games from 9/26/15 to 7/7/18, the longest streak in the majors since Miguel Tejada (558) from 2004-07; the first 407 were at shortstop, the longest streak since Cal Ripken, Jr. started in 2,216 straight at shortstop from 1982-96... Hit his first career walk-off home run on 5/29 vs. MIN, a solo homer off of LHP Taylor Rogers in the 14th inning; the latest walk-off home run by a Royal since Jon Nunnally's 16th inning homer on 7/29/95 vs. DET...Batted .326/.367/.442 (42-for-129) in 37 games from 8/1 - end of the season...Had a season-long eight-game hitting streak from 9/18-30, hitting .419 (13-for-31) during this stretch... Ranked sixth in the American League (min. 70 PA) in hitting during September, with a .348 (23-for-66) average... Had a career-high-tying four RBI on 5/11 at CLE... Ranked third in the AL with eight sacrifices. Started all 162 games for the second consecutive season and has made 333 consecutive starts-all at shortstop-dating back to Sept. 26, 2015…according to Elias, it's the longest streak at any position in Royals history and the longest active streak in the Majors…it's also the longest streak by a shortstop since Cal Ripken Jr. started 2,216 consecutive games for Baltimore from 1982-96 ... One of five players to play in 162 games in 2017, along with Joey Votto, Rougned Odor, Freddy Galvis and Eric Hosmer… he and Votto were the only players to start every game ... Became the only player in Royals history to start 162 games in a season, and he's done it three times (2017, '16 and '14) ... He's the first player to start 162 games in consecutive seasons since Prince Fielder from 2011-13...also the only player to start 162 games at shortstop since Jimmy Rollins during his 2007 National League MVP season ... Set a franchise record with 36 doubles as a shortstop, one more than Kurt Stillwell's 35 in 1990…his 36 doubles were fourth most in the Majors as a shortstop in 2017, trailing only Elvis Andrus and Francisco Lindor (43 each) and Andrelton Simmons (38) ... Connected for six home runs and 54 RBI, which were both one shy of matching his career highs set in 2016 ... Hit .297 (35-for-118) with runners in scoring position ... Named Royals Player of the Month for September, batting .337 (33-for-98) with 15 runs, 11 doubles, three HR and 12 RBI…his 16 extra-base hits were the most by a Royals shortstop in any calendar month, and tied George Brett (1975) for the third-most in September in franchise history, trailing only Danny Tartabull (18 in 1987), Billy Butler (17 in 2009) and Hal McRae (17 in 1977) ... Hit .178 (41-for-230) through his first 60 games, but hit .295 (109-for-369) over the last 102 games (since June 10), raising his season average 72 points to .250 ... Reached safely in 20 consecutive home games from June 7-July 21, a stretch in which he hit .386/.427/.600 (27-for70) with nine extra-base hits and 15 RBI ... Hit his first HR of the season on June 10 in San Diego, snapping a streak of 264 at-bats without one dating back to Sept. 22, 2016 at Cleveland ... Had a season-best 11-game hitting streak from Aug. 9-20 ... Matched a career-high with four hits (two singles, double, triple) Sept. 6 at Detroit, his ninth career four-hit game ... Recorded his fourth career walk-off RBI on April 16 vs. the Angels, breaking a scoreless tie in the ninth inning to mark the Royals' fifth 1-0 walk-off win in club history. One of two players in the Majors to start all 162 games (also, Jonathan Schoop)…he's the only Royal ever to start all 162 games in a season, and he's done it twice (also, 2014)...He's made 171 consecutive starts dating back to Sept. 26, 2015…according to Elias Sports Bureau, it's the longest active streak in the Majors...Played in 943 games since the start of the 2011 season, third most in the Major Leagues, trailing Robinson Cano (954) and Adrian Gonzalez (946)...Set career highs in at-bats (637), home runs (seven) and RBI (55)…his seven home runs were more than he had in his previous two seasons combined (six)...Hit his first home run of the season on June 24 vs. Houston off reigning Cy Young Award winner, Dallas Keuchel, snapping a 455 at-bat steak without a home run, which was the third-longest active streak in the Majors (non pitchers), according to Elias...Hit his second home run on Aug. 7 vs. Toronto, a solo shot to right-center field to mark his first career home run to the right of center field...Six of his seven home runs came in his last 186 at-bats from Aug. 7 through the end of the season…ranked fourth among AL shortstops during that span...Reached safely in a team-high 25 straight home games from May 15-July 9...Matched his career best with four hits twice: May 3 vs. Washington and May 15 vs. Atlanta...Had two separate 14-game hitting streaks…the first was from June 18-July 3, in which he hit .371/.365/.500 (23-for-62) and the second was from Aug. 23-Sept. 6, in which he hit .357/.379/.643 (20- for-56)...Hit .300 (33-for-110) with 17 RBI in August, his most RBI in any calendar month in his career...Led the AL with 10 sacrifices…his 64 sacrifices since the start of 2011 are second most in the Majors, trailing only Elvis Andrus (70)...Recorded 17 stolen bases for the second straight season, matching his lowest single-season total since joining the Royals in 2011…during that time, his 148 steals rank sixth in the AL. Had an impressive first half and was named to his first American League All-Star team, being selected as the starter at shortstop…he led off the fifth with a single off Clayton Kershaw in the Midsummer Classic in Cincinnati...Earned his first Rawlings Gold Glove, becoming the first KC shortstop to receive the honor...also named a co-winner of the Joe Burke Special Achievement Award by the Kansas City Chapter of the BBWAA...Batted .290 (92-for-317) with 16 doubles, two triples and two homers before the All-Star break, while he batted .220 (65-for-295) with eight extra-base hits after the break...Played in 148 games during the regular season, missing two stretches due to injury...Hit out of the leadoff spot for much of the year, batting .259 with a .296 on-base percentage…the Royals went 82-49 with Escobar hitting first in the batting order in 2015...club is 103-59 (.636) with him leading off over the past two seasons during the regular season and postseason...Blasted a pair of leadoff home runs, going deep on the first pitch May 2 off Anibal Sanchez in Detroit and on May 29 off Jake Arietta at Wrigley Field...Hit safely in his first nine regular season games, which extended a streak from 2014 to 18, longest of his career...Matched a career high with four hits on July 8 vs. Tampa Bay, marking his sixth career game with four hits…also matched a career best with three runs scored Opening Day vs. the White Sox...Recorded his second career walk-off hit, singling home the winning run in the 10th inning of a 2-1 triumph over Houston on July 25...Started all 16 postseason games at shortstop, batting .329 (23-for-70) with four doubles, three triples, a homer and 13 runs scored...Named Most Valuable Player of the American League Championship Series vs. Toronto, batting .478 (11-for-23) with two doubles, a triple and six runs scored…led off each of the first four games of the series with a hit, setting a postseason record...Set a franchise record, hitting in 15 straight postseason games (Game 2 of ALDS to Game 5 of World Series)… passed previous mark of 13 straight by Lorenzo Cain (2014-15)...His hitting streak was the longest in a single postseason and is two shy of the Major League record (17), held by Manny Ramirez (2003-04), Derek Jeter (1998-99) and Hank Bauer (1956-58)...Also claimed the Royals record with 23 hits overall in the postseason…he finished three hits shy of the MLB record (26), held by Pablo Sandoval (2012)…his total established a Major League record by a shortstop, passing Derek Jeter, who had 22 hits in three different postseasons...Went 12-for-26 (.462) when leading off an inning in the postseason, which included 7-for-15 (.467) with a hit by pitch leading off the game...Led off Game 1 of the Fall Classic with the 12th inside-the-park home run in World Series history, and first since October 12, 1929...first inside-the-park homer to start a World Series game since 1903...Collected four hits in Game 4 of the ALCS at Rogers Centre, including a triple to lead off the game…he joined George Brett (twice in 1985) and Lorenzo Cain (2014) as the only Royals to record a four-hit game in postseason play. Alcides was the only Royals player and one of just four in the Major Leagues to appear in all 162 games this season, along with Atlanta's Freddie Freeman, Tampa Bay's Evan Longoria and San Francisco's Hunter Pence...He's played in 633 games over the past four seasons, tops among Major League shortstops and fifth overall...Had a bounce-back season, batting .285 with 34 doubles, five triples and three homers, after hitting just .234 with 28 extra-base hits (20 doubles, 4 triples, 4 homers) in 2013...Ended the season on a nine-game hitting streak, batting .425 (17-for-40) with three doubles and three RBI during the streak...Hit out of the leadoff spot the last two weeks of the regular season, batting .362 (25-for-69) with five doubles, a homer, nine runs scored and a .397 on-base percentage...Recorded a career-high 34 doubles, which were second-most by a Royals shortstop, trailing only Kurt Stillwell's 1990 total (35)...Esky's total ranked fourth among A.L. shortstops and tied for 16th in the league overall...Hit .313 against left-handed pitching (46-for-147), which included a .333 average (19-for-57) vs. lefties after August 1...Also batted .306 (55-for-180) during day games...Ranked third in the American League and fifth in the Majors, hitting .374 (34-for-91) during the month of June;this included a career-best 12-game hitting streak from June 1-14...Had a .527 slugging percentage (10 doubles, 2 triples) during June, his highest in any month during his Major League career...Swiped 31 bases, the second-highest total of his career (35 in 2012), which tied for fifth in the A.L...Caught stealing three times over the final month of the season, but still ranks second in the Major Leagues with an 88.9 percent stolen base percentage (88-for-99) since the start of 2012...Had 24 infield hits, good for 12th in the American League...his 117 infield knocks since the start of 2011 are thirdmost in the Majors, behind the Yankees' Ichiro Suzuki (132) and Philadelphia's Ben Revere (120)...Matched a career high with four hits in a game twice over KC's final 29 contests...Played in all 15 postseason games, batting .292 with five doubles, a homer, eight runs scored and five RBI...Recorded four sacrifices during the postseason, which led all participants and were the most by a Royal in a single postseason...Had a nine-game hitting streak, which stretched from Game 3 of the ALDS (October 5) to Game 4 of the World Series (October 25)...It was tied for the second-longest by a Royal in postseason play, behind only Amos Otis who hit safely in 11-straight playoff games from 1978-80...Homered in Game 1 of the ALCS in Baltimore, becoming just the second Royals shortstop to homer in a postseason game, joining Freddie Patek (Game 2 of 1978 ALCS)...Also doubled in the go-ahead run in the ninth inning of Game 2 of the ALCS. Alcides hit .234 while starting 156 games, the third-most among American League shortstops... Swiped 22-of-22 bases, the most in a single-season by a Royal without being caught...the most in the Majors by a player without being caught since Philadelphia's Chase Utley was 23-for-23 in 2009... Ranked fifth in the A.L. with nine sacrifices and ninth with 24 infield hits...his 22 steals were third-most by an A.L. shortstop... A finalist for a Rawlings Gold Glove...committed just two errors after the All-Star break...his .993 fielding percentage after the break was tops among Major League shortstops (minimum 150 chances)... Recorded a pair of 10-game hitting streaks, August 4-13 and September 6-16...collected his first career walk-off hit, doubling home the winning run in the ninth inning of a 4-3 triumph over Baltimore on July 24. Alcides posted a breakout offensive season and was named the Joe Burke Special Achievement Award winner by the KC Chapter of the BBWAA...Set career highs in average (.293), at bats (605), hits (177), doubles (30), home runs (5), RBI (52), stolen bases (35), on-base pct. (.331) and slugging pct. (.390)...Hit .293, the second-highest mark in the Majors among shortstops trailing only New York's Derek Jeter (.303)...His 177 hits were the most by a Royals shortstop in club history...Angel Berroa posted 164 hits in 2005...With 30 doubles and 35 steals, became the first Royal to post a 30 double/30 steal season since Carlos Beltran (44 2B, 35 SB in 2002) and the first Royals infielder ever...Was fifth in the league with a career-high 35 thefts and was the first KC shortstop to post back-to-back 25+ steal seasons since Freddie Patek (5 straight seasons from 1974-1978)...is just the third KC shortstop with 30 stolen bases, joining Patek (5 times) and U.L. Washington (once)...Recorded his first career 2-HR game on July 14 vs. Chicago and the first by a Royals shortstop since Jay Bell on April 14, 1997 at Toronto...Posted a career-best 11-game hitting streak from September 4-15...he hit .347 (17-for-49) during the streak...Recorded 4 infield hits on August 18 vs. Chicago, the first time that's been done in the Majors since the White Sox' Roberto Alomar did so on August 20, 2003 vs. the Angels...His 25 triples since the beginning of 2010 are the eighth-most in baseball...his 7 in 2012 were tied for sixth in A.L...He signed a 4-year contract extension with two club options for 2016 and 2017 prior to the season on March 15. Alcides had a standout season with the glove and held his own with the bat in his first season with the Royals. ... Tied for the MLB lead with 158 games at short while leading the Majors in assists (459), total chances (745) and putouts (271) ... also ranked second in innings played (1,387.1) and tied for fourth with 98 double plays ... his .980 fielding percentage ranked fourth in the league. ... Recorded 8 triples, which ranked tied for fourth in the American League ... his 18 triples since the beginning of 2010 are the sixth-most in the Majors. ... His 18 sacrifice hits were second most in MLB and tied for the second-most in a single season in Royals history, only trailing Tom Goodwin's 21 in 1996. ... Stole a career best 26 bases, which is the seventh-most all-time among Royals shortstops ... he is just 1 of 4 shortstops in club history to swipe 20 or more in a season (Freddie Patek, U.L. Washington, Angel Berroa). ... Batting .203 after an 0-for-4 on June 6, then hit .286 the remainder of the season ... batted .324 in September. ... Hit in 11 of 12 games with 9 multi-hit efforts (5 straight from 6/10-15) from June 7-19, batting .512 over that span. Alcides spent his first full season at the big league level, making 135 starts...His 10 triples tied for third in the National League...The 10 triples established a new Milwaukee franchise rookie record, breaking the previous mark of 8 set by Bob Coluccio (1973) and Scott Podsednik (2003)...Had two triples on April 21 at Pittsburgh, becoming the first Brewer since Geoff Jenkins on April 6, 2004 at St.Louis. Entered the season as the top prospect in the Brewers organization according to Baseball America...that same publication rated him Best Defensive Infielder and Best Infield Arm in the organization...Spent most of the season at Triple-A Nashville, where he batted .298 with 4 HR, 34 RBI and 42 stolen bases in 109 games...Led Nashville in runs (76) and stolen bases (42)...hisstolen base total ranked third in the Pacific Coast League...Participated in the All-Star Futures Game in St. Louis and went 2-for-4 with 2R as he batted leadoff (World Team)...Was named to the All-PCL Team...Following the season was named the sixth-best prospect in the Pacific Coast League by Baseball America...Was selected to the Topps Triple-A All-Star Team...Was recalled by the Brewers on 8/12 and spent the restof the season in Milwaukee Batted .304 with 1 HR and 11 RBI in 38 games with the Brewers...made 33 starts, all at shortstop...Batted .300 (9-for-30) with runners in scoring position...Recorded his first Major League stolen base on 8/12 vs. San Diego after entering the game as a pinch runner for Prince Fielder...Made his first Major League start on 8/13 vs. San Diego and went 1-for-4 with a run...His first Major League home run was a solo shot off Craig Stamen on 8/23 at Washington...Had his best game of the season on 9/16 at Chicago-NL as he went 4-for-5 with 2R, a double and 3 RBI...Batted .337 (28-for-83) with 9 RBI over his last 24 games of the season...Played for Lara in the Venezuelan Winter League andwon the league batting title at .393 (68-for-173) along with 2 HR, 19 RBI and 16 stolen bases in 45 games...Enters 2010 as the top prospect in the Brewers organization according to Baseball America...was also named Best Defensive Infielder and Best Infield Arm in the organization. Entered the season as the third-best prospect in the Brewers organization according to Baseball America...Was the co-winner (with Mat Gamel) of the Brewers' Minor League Player of the Year Award...Spent most of the season at Double-A Huntsville, where he batted .328 with 8 HR, 76 RBI and 34 stolen bases in 131 games...Made the Southern League midseason and postseason All-Star teamsv...Led the Southern League in hits (179) and was among the leaders in stolen bases (T2nd, 34), runs (3rd, 95) and batting average (3rd, .328)...Was named Southern League Player of the Week from 7/7-7/13 and 8/4-8/10...Following the season was named the fifth-best prospect in the Southern League by Baseball America...Was selected to Topps' Double-A All-Star Team...Was recalled on 9/1...Appeared in 9 games with the Brewers, all off the bench...Made his Major League debut on 9/3 vs. New York-NL and produced a single in his first big league at-bat off Scott Schoeneweis after entering the game on defense...Replaced the injured Rickie Weeks on the postseason roster prior to Game 4 of the NLDS vs. Philadelphia...Played for Lara in the Venezuelan Winter League. March 25, 2019 Chicago White Sox signed free agent SS Alcides Escobar to a minor league contract. March 25, 2019 SS Alcides Escobar assigned to Charlotte Knights. March 21, 2019 Norfolk Tides released SS Alcides Escobar. March 20, 2019 Baltimore Orioles released SS Alcides Escobar. February 16, 2019 Baltimore Orioles signed free agent SS Alcides Escobar to a minor league contract and invited him to spring training. 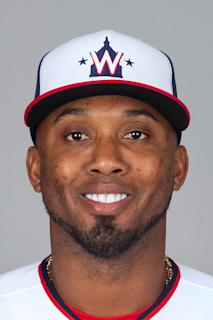 February 16, 2019 SS Alcides Escobar assigned to Norfolk Tides. October 29, 2018 SS Alcides Escobar elected free agency. January 29, 2018 Kansas City Royals signed free agent SS Alcides Escobar. November 2, 2017 SS Alcides Escobar elected free agency. January 6, 2017 SS Alcides Escobar assigned to Tiburones de La Guaira. May 8, 2015 Kansas City Royals activated SS Alcides Escobar from the 7-day disabled list. December 4, 2014 SS Alcides Escobar assigned to Tiburones de La Guaira. October 11, 2012 SS Alcides Escobar assigned to Cardenales de Lara. December 31, 2011 SS Alcides Escobar transferred to Aguilas del Zulia from Cardenales de Lara. October 27, 2009 Alcides Escobar assigned to Cardenales de Lara. August 12, 2009 Milwaukee Brewers recalled Alcides Escobar from Nashville Sounds.